While we are mainly focused on grid-tied residential solar energy installations and commercial solar applications, we’re also incredibly supportive of the adoption of solar power solutions at every level, including mobile and offgrid solar generators, as every deployment of solar adds to the momentum of the clean and renewable energy revolution. And that’s why we’re helping to spread the word about a unique opportunity for US colleges and universities, which allows select campuses to get mobile solar energy generators, light towers and electric car charging stations at no cost to the universities themselves. 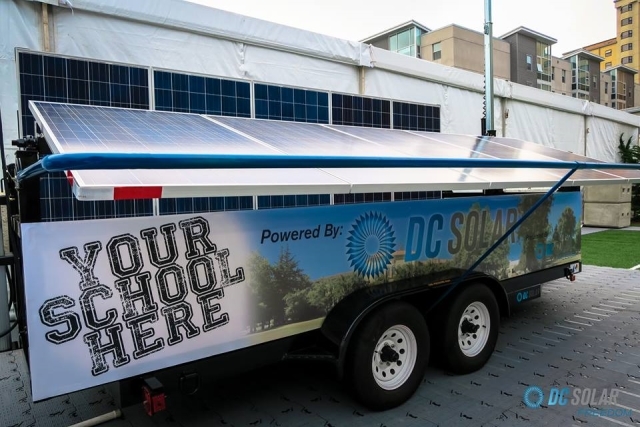 A California-based Benefit Corporation, DC Solar Freedom, has partnered with DC Solar Distribution and educational institutions to deploy mobile solar generating stations, charging stations for both personal devices and electric vehicles, and solar-powered light towers on select campuses nationwide. The founders of DC Solar Freedom, Jeff and Paulette Carpoff, are administering an underwriting process with companies looking to reduce their carbon footprint and advance their sustainability initiatives, which will enable the use of these no-cost solar solutions at college and university campuses. According to DC Solar Freedom, the company is “likely” to place more than $150 million dollars worth of mobile solar units through the Collegiate Placement Program over the course of the next year, the use of which will serve as a very visible example of the viability of solar energy and a practical method of integrating clean energy on campus, without the associated capital costs. The actual cost of each mobile solar generator is about $150,000, but thanks to a strategic partner lease arrangement with DC Solar Distribution, Inc., universities can take advantage of the benefits of these renewable energy solutions without shelling out the cost themselves. The lease arrangements, which connect socially responsible companies with the opportunity to underwrite the program, will allow DC Solar Freedom to cover the unit rental costs, while also raising awareness of the practicality of adopting solar as a sustainable energy source. According to DC Solar Freedom, most of the mobile solar generating units are available as a hybrid, which uses an automatic backup biodiesel generator to charge the batteries during the times that the sun isn’t able to (extremely cloudy or stormy days). These hybrid units switch over to the biodiesel generators at 40% of battery capacity and switch off at 90%, allowing for uninterrupted power without reliance on traditional fossil fuels. The company also claims that contrary to popular belief, “the solar array is still making 20-30% of its power on cloudy days,” which counters most arguments against solar due to suboptimal weather conditions. Learn more by contacting DC Solar. Find out how you can put the sun to work for you today!